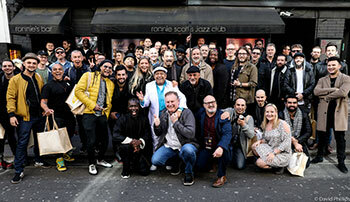 Latin Percussion (LP) recently celebrated more than half a century as the largest hand percussion brand in the world by hosting a second Rhythm Jam concert at the world famous Ronnie Scott’s jazz club in London. Special guests at the event were Grammy Award-winning percussionist Giovanni Hidalgo and Jamiroquai’s Sola Akingbola with his band, Critical Mass. The entire concert was filmed and will be released on LP’s YouTube channel later in the year. LP’s social media platforms will be posting further information regarding the concert broadcast. Founded in 1964, LP has been a leading pioneer and major innovator in the development of percussion instruments. Such is the company’s reputation many world-renowned artists, including Giovanni Hidalgo, play their instruments and work with them to develop new ones with specific sounds and styles. Giovanni Hidalgo is arguably the world’s greatest contemporary conga player. His innovative approach has changed the art, concept and technique of conga playing, taking it to new heights. In recognition of his contribution to the world of percussion, the event saw him presented with the newly-established Latin Percussion Legacy Award. The party showcased Sola Akingbola (Jamiroquai) and his Critical Mass band members, Michel Catellanos Rojas (drums), Leon Stenning (guitar), Jeremiah Olaleye (bass and vocals) and Nathan Williams (keyboards). Joining them for the jam were the very best of British and European percussionists including the multi-award winning Pete Lockett (Peter Gabriel, Jeff Beck), Karl Vanden Bossche (Blur, Gorillaz) João Caetano (Incognito), Rob ‘Skins’ Anderson (Alexander O’Neal), Orlando Poleo and musical theatre’s go to percussionist Will Fry (Motown The Musical, Lion King). To find out more please go to http://www.lpmusic.com/ or their social media pages on Facebook, Twitter, Instagram and YouTube.